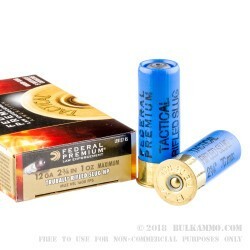 The Federal Tactical 12 gauge Ammo line up has built a reputation for reliability, high quality, and powerful loads since its debut. 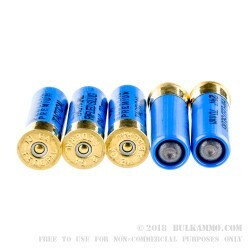 Their Tactical 12 gauge products for Law Enforcement have a 2 ¾” overall shelllength (after being fired) with a 1 ounce rifled Tru-Ball slug to maximize accuracy in the typical smoothbore shotgun barrel. 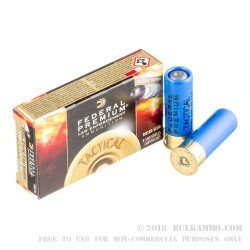 These shotshells have a known 1,600 feet per second muzzle velocity and use a high brass, reloadable, Federal brand hull with the famous Boxer type 209 primer to ensure the powder ignites reliably. The hulls are blue in color for rapid identification in the field, and possibly as a nod to law enforcement or the “boys in blue”. 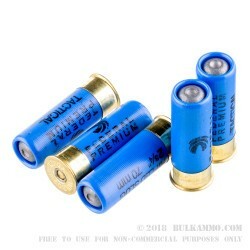 They come in boxes of 5 rounds, with 50 boxes to a case, giving you a total of 250 shells. Ideally suited for a fun day at the range, practicing with your new 12 gauge shotgun, a 3-gun competition, or for a Police Officer on patrol. Federal’s Tru-Ball technology consists of a large diameter plastic ball that is loaded directly on top of the wad and before the slug. The ball itself helps the rifled slug remain centered as it travels down the smoothbore shotgun barrel, ensuring a high level of accuracy and muzzle energy. The 3 components of the Tru-Ball system come apart reliably each time as the round exits the barrel.